We'd like to introduce you to our daughter, Aadya. She is a two and a half year old tyrant who will chat your ears off until she gets exactly what she wants. She is also a little girl with a terrible medical diagnosis. After a long diagnostic journey, earlier this year, we learnt that our daughter has a rare genetic neurodegenerative mitochondrial disease called Leigh's Syndrome that has no known cure. What this means is that the disease is caused by a defect in her genes, affects all her major organs - especially the brain and nervous system and gets progressively worse with time. Doctors try to treat the symptoms rather than the disease itself. While it is often times deemed fatal, today, there is more information on kids surviving to their teens and beyond. For a child who met all her milestones and seemed to have a typical first year, Aadya presents a completely different picture today. Crawl. Sit-up. Stand / walk with support. Drink from a straw. These are all things she could once do with ease. These are all things she can no longer do. And these are all things we hope she will one day be able to do again. To this end, we've three goals that we hope this campaign can help us meet. Our first and most important goal is to help raise funds for a research study. 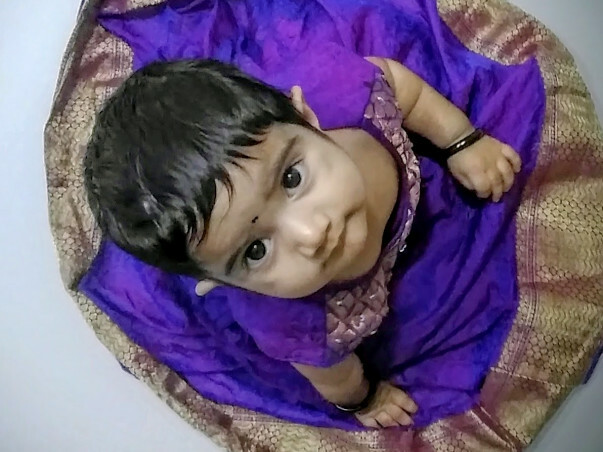 The more we see the devastating effects of the disease on Aadya and other kids like her, the more we realize that just waiting for someone to rally around to one day find a cure for this disease is not something we can do. We owe it to Aadya and all kids like her to give it our best shot to help them not just manage this disease, but to beat it and thrive. Today more than ever before, there is hope for a gene therapy based cure. So, 100% of funds collected will be given to researchers currently working on finding a cure for this disease. The research we're hoping to contribute to is slated to start in the University of Texas South Western located at Dallas, Texas. The research will be headed by Dr Berge Minassia and Dr Steven Gray . We have one final hope, as well. A hope that we aren't leaving a single stone unturned. Who is to say that faith or prayer cannot move mountains. So, maybe you say an extra prayer for Aadya(if you believe) or send her positive vibes(if you don't). We'll take all the faith and prayers that come our way. This campaign here has been awfully quiet - in part because we now have a Facebook page which has regular updates on everything that is happening for the research and fundraising. Do like the page to get regular updates. 1. We've heard from the researchers that they are currently setting up the mice colony to begin the study. We're hoping for some preliminary data in the first half of 2019. We may also be able to kick off one of the Toxicology studies in parallel and that is something we're exploring currently. If all goes as per plan, kids could start getting enrolled for the trial as early as 2020. We've our fingers crossed and are really rooting for this to go as per plan. Meantime, we're trying our level best to get funds lined up for the forthcoming phases of the research study. 2. We kicked off a musical #singforaadya campaign. The campaign flooded Facebook, Instagram and Twitter with songs from our friends, family, well wishers and most heart warmingly - absolute strangers. Some very well known actors, singers, Music Directors, RJ hosts added their influence and support to this campaign. You can always listen to these songs by clicking on this link right here ->#singforaadaya. We'd love if you'd join in by singing and adding your voice to this chorus of support for Aadaya and this campaign! To know more about how to participate, here is the FB post announcing the details. 3. We spent an eventful five days admitted in the hospital with little Aadya down with several viral infections. 3 days in the ICU and another two on the floor. Thankfully, the story ended with us getting back and Aadya recovering well. More importantly - we see no signs of regression, which is the biggest fear. Small bouts of infections are known to steal precious life skills from these young ones. Aadya has already gone through one bout of regression and we're breathing a little easier now that the latest threat of regression seems behind us. 4. Aadya and a fellow warrior Kshiti were featured in a publication called NRI Pulse. You can read their stories right here. 5. We're now officially part of the Cure SURF1 foundation. We're hoping together with other families we can give all these kids a fighting chance at a meaningful life. Thank you all so much for all the love and support you've extended to our little girl and all kids like her, so far. We'd really appreciate if you'll walk with us right until the finish line. Let us see this project through together! We are endlessly grateful to everyone who has opened their hearts to support our little girl. Your donations are a show of faith in finding a cure for her condition. And with every message, every email and every call, you've given us so much more to hope for. For this overwhelming show of support, Aadya's family is truly indebted to you. When we joined our friends over at Cure SURF1(a non-profit set up by some friends) and offered to fundraise, we were faced with the need to raise $3 Million to fund the full research. While the amount seemed staggering, we decided to tackle a little more than 10% of this amount($335,000) through two fundraisers - in India and US. The response to this fundraiser has given us hope to not just meet what we planned to raise in India but maybe even go beyond it. We also have some updates on the research itself. Cure SURF1 has confirmed that they were able to raise the full amount needed for a pre-clinical study. This is a lab-based study performed on animal models. This is great news for us - as this means that, if everything goes well, the clinical trial is just a few years away! And for us, it is very important that the clinical trial timeline is as short as it can be because with a progressive disease, each passing day is a day we cannot afford to lose. We'll keep this fundraiser going with a revised goal in keeping with our plan of raising $335,000. Do continue to share Aadya's story and support us. The road to this clinical trial, like all other research projects, will be long. But, we promise to keep you updated every step of the way. Thank you for joining us on this path and staying with us till we find a cure! God bless u dear.. god ll definelely show u a path..